A few things can be observed from this figure. 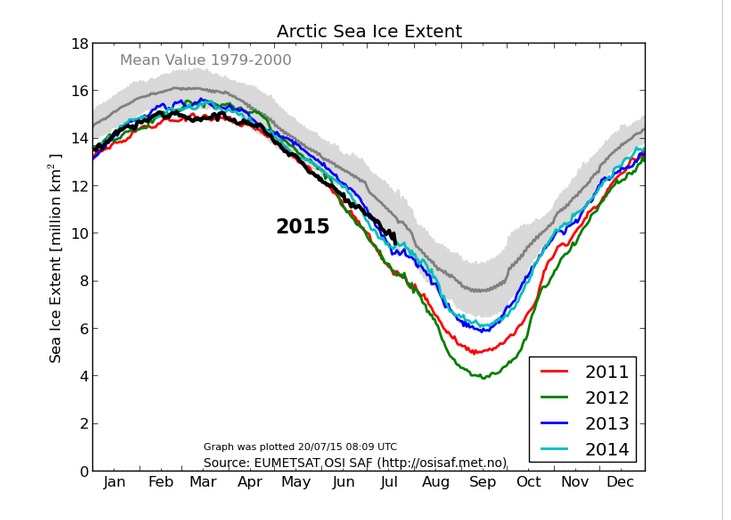 First, the ice extent reaches a maximum in mid-February, and a minimum in early September. The average maximum extent for the '79-2000 period was approximately 16 million km2. The recent few years are only 1 million less, at approximately 15 million km2. That is a decrease of only 6.2 percent over 35 years. The minimum extent has a much greater variation, with the '79-2000 average of approximately 7.5 million km2. Recent years showed a minimum of 4 million km2 in 2012, and 6 million km2 in 2013 and 2014. The extent in 2012 led to much press over the ice is melting and claims that we are all going to die from sea level rise, by the warmists. The extent for 2015, though, is only a bit past the mid-way from maximum to minimum, March to September. That black line has several things to convey. First, the other recent years (2011 - 2014) all had approximately the same rate of melting - the slope of the line - as does 2015 from approximately April 15 through June 1. But, something is different starting in about June 1. The recent years all began melting more rapidly starting June 1 (the slope of their lines increased downward), but the line for 2015 continued on its early slope. One can speculate about the causes of the steady melting, and not the accelerated melting of the past few years. Melting occurs from four sources: heat absorbed by the ice from seawater from below, heat absorbed from warmer air from above, heat absorbed from radiant heat from sunlight, and wind that breaks up the ice then pushes the ice into warmer water where melting takes place. Warmists will add a fifth source of heat bombarding the Arctic ice: radiant heat from CO2 and water molecules in the atmosphere above the ice. So, what is different this year, that is not accelerating the ice melt? One cannot determine the cause from the simple figure above. One thing we do know for certain, though, is that the tiny amount of CO2 added to the atmosphere during the past year could not be responsible for a sudden and large change in melt rate. This graph bears watching closely, especially as the upcoming IPCC meeting in November will attempt (once again, because they failed each previous time) to obtain an accord to retard fossil fuel use world-wide. Warmists, especially those in the alarmist camp, have a very difficult time refuting solid evidence of Arctic ice growing, year over year over year. copyright (c) 2015 by Roger Sowell. "The April 2015 volume was 24,200 km3, close to the April 2010 value. The April 2015 volume was 26% below the maximum April ice volume in 1979 and 13% below the 1979-2014 mean, and about 1 standard deviation above the long term trend. The June 2015 volume was 18.500 km3, 900 km3 above to the 2014 June value." "The long term trend is about -2,800 km3/decade."